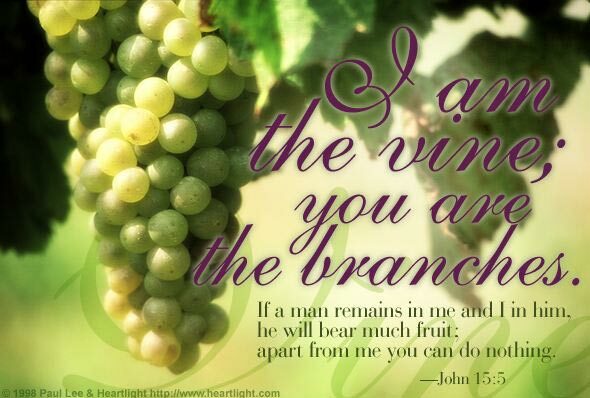 We take on Jesus' character (bear fruit) by remaining intimately connected to him. The distance between heaven and earth is not so great when heaven lives within us. In John 14, Jesus reminded us that if we will obey him, he will come and live in us and will reveal himself to us. So as we obey him, we know him better. His life becomes real in us. Precious Lord, I want to obey your word, your will, and your example. I want to obey you to honor you, to love you, and to know you. So please, help me better come to know you as I more closely walk in your steps. Help me to know what it means to live your life in my world. Because of Jesus' mighty name I pray and thank him as my Lord. Amen.